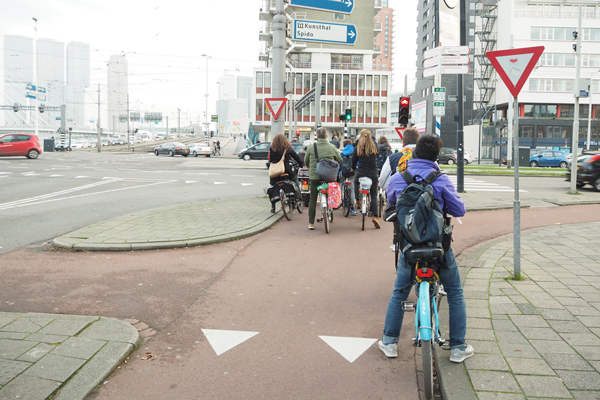 There are many things Americans can learn from Dutch bicycle infrastructure. The infrastructure (in addition to their road safety laws) is so unbelievable well done that the bike modal share is around 30% in the entire country (50-60% in some cities), the traffic fatality rate for all road users is 3X lower than in America, and up to 9X more safe for cyclists per km riding in spite of having kids and adults well into their 80s riding bikes. And the transportation engineers/urban planners don’t stop there; they are constantly improving on it at a rapid rate. 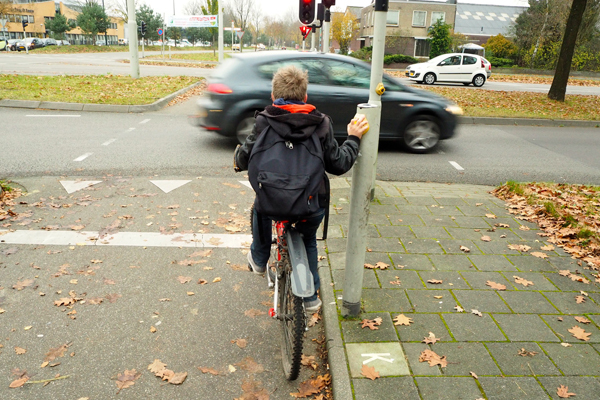 A boy biking home alone from school in Apeldoorn. I see grade school kids biking alone to schools, taking field trips in groups, and I even see them taking their bikes onto trains (intercity routes, not within cities). You don’t just see young to middle-aged adults riding but every demographic with relative equal number of males to females including disabled people on their electric-assist wheelchairs on bike paths. Pretty much, how you would see in any population in the world. Everybody! So, here are a list of seven bike facilities that Americans can copy from the world’s best infrastructure without removing road space for cars. Like I said, there are so much but I am listing the seven obvious ones. When I was touring through 15 or so cities, not every road has bike path that is protected from automobiles. The ones that are not segregated are similar to white painted lanes that you see everywhere in America. However, the Dutch know it is absolutely necessary to have protected intersections even though roads have painted lanes. Because more than half of all bike collisions with cars occur at intersections, it is more important to have protected intersections than protected bike paths where space is limited. The protected intersections are clearly marked with red asphalted cross-bikes; shark teethed yield signs for drivers when approaching to make turns; cars are set further behind cyclists when both are waiting; and curb islands at corners to make drivers turn slower and to have a better view ahead. A nice explanation is found here. A protected intersection in Rotterdam. Note curb island at left side of photo. Another way to reduce crashes at crossroads (ones without roundabouts) with cars is to have traffic lights separately for cyclists. 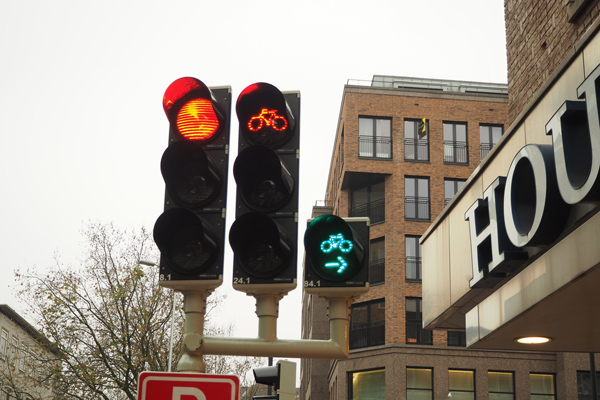 In Zwolle, the cycling city of 2014, many of its unprotected intersections have bike traffic lights. Bike traffic lights have sensors too but work in congruence with traffic lights for automobiles. In Groningen, the cycling city of 2002, green bike traffic lights on some busy streets allow all cyclists from every direction to cross. What these bike traffic lights do is that only cyclists are crossing through which makes it safe. Also, these all work because cars are not allowed to make right turns on red which makes bike traffic lights work really well in both unprotected and protected intersections. Traffic lights for cyclists at a junction in Utrecht. Cars are not allowed to turn right on red. Roundabouts in the Netherlands are extremely common as elsewhere in other European countries. Stop signs are uncommon. Stop signs are inefficient and unsafe for both drivers and especially for bicyclists. Roundabouts get more cars moving than Stop signs and reduce wear and tear, and emission. And cyclists won’t need to stop due to momentum. This is actually more predictable for all road users and predictability makes roads safer. Not all drivers stop at Stop signs, and only some bicyclists are willing to stop, so this makes streets unsafe for all road users because of the unpredictability. Secondly, cars are coming from every direction which is also dangerous. At the junctions of roundabouts, roads are narrowed with enough space for cars going into and leaving from one spot where they are crossing. The narrow road brings autos down to a slower speed and if that’s not enough, speed bumps are placed just before the roundabouts to further impede speed. 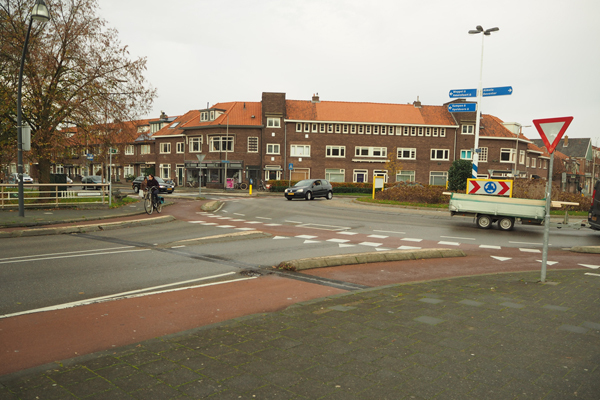 A protected roundabout in Zwolle. Note the one lane each way for cars. In cities like Oakland and San Francisco, it is just common sense to have bike parking at transit stations but bike racks at bus stops? Not so much. Multi-modal transport is key to any city’s transportation sustainability, and biking is a huge part of it. Providing bike racks at bus stops is just as important as having bike racks at train stations. BART and Caltrain, both rail transits for the Bay Area, certainly don’t go everywhere so buses are there to compensate. Particularly in the suburban regions, buses are the only public transport so installing bike racks next to bus stops will enhance multi-modal transportation. 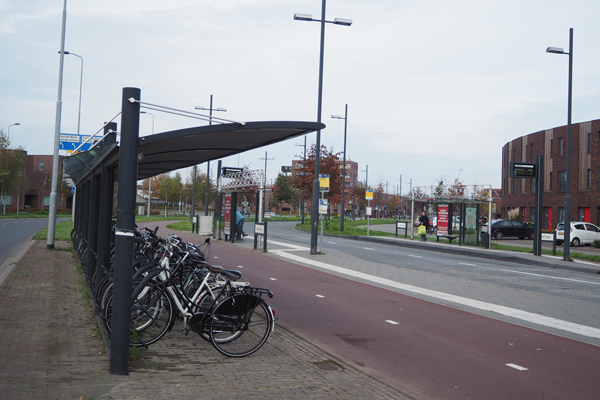 A bus stop with bike racks in Eindhoven. 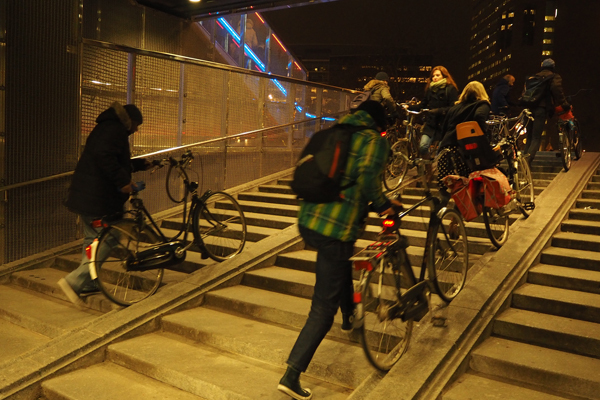 At every bike parking station underground or above ground in the Netherlands, there are bike ramps (and some have bike escalators!) including elevators. Bike ramps are built at an incline that is easy to push up or down the stairs. There is only one bike ramp I found in all underground stations in the Bay Area and that is just pitiful on every level. We have bike parking but no bike ramps. Not all elevators are at every station and if there are, they are slow, cramped and reek of urine. Bikes are not allowed on escalators and how do transit officials expect women to carry their heavy bikes down and up the steep stairs. Bike ramps at a bike parking garage in Utrecht. Note the easiness of pushing bikes up and down the stairs. Suburbia and exurbia run rampant in the States and you rarely see people walking on sidewalks. It’s mostly empty. If you think about it, who would walk for such a distance when cars are there in every household? As I was riding between towns and cities, what I noticed surprises me. There are no sidewalks and if there are which is far and few in between, are very narrow. What’s in place of sidewalks are cycle tracks. It’s a brilliant idea! The cycle tracks are actually foot paths as well. 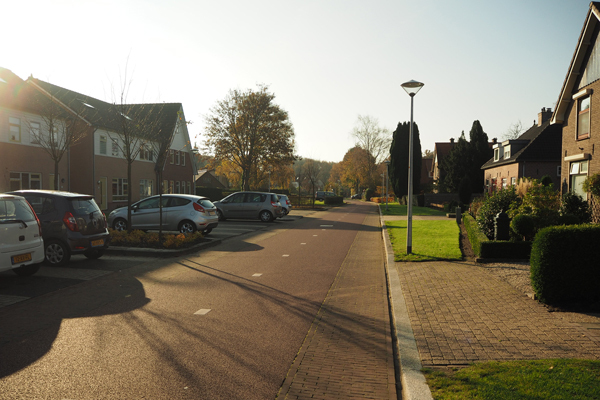 The Dutch know that in far flung neighborhoods where cars are the major transport, you are not going to see pedestrians walking much so they turn that space into both foot and cycle paths. We can do that here as well in the States and that won’t impede the all mighty cars’ space. 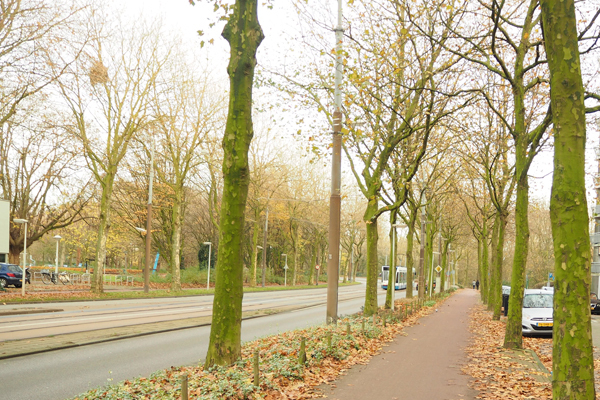 A path for both pedestrians and cyclists outside of Amsterdam city center. In some parts of the Bay Area like Berkeley and Palo Alto, there are “bicycle boulevards” that bicycles and cars share residential streets equally and at a low speed. In the Netherlands, fietsstraat (translated as bicycle streets) are taken a step further by turning residential streets into streets for bicycles with cars as guests. And fietsstraat are built to be like cycle tracks with the usual red asphalt (see photo below). Having this type of road design tells who clearly has the priority more and will appeal to inexperienced and risk-averse riders. Because bicycle boulevards are meant to be shared equally between drivers and cyclists and that naturally always puts cyclists as guests, especially when they still look like streets for cars. Here, cars are guests on a cycle street or fietsstraat in Dutch. Transportation and city officials, if you want to make your city livable for all demographics and reduce traffic fatalities, these are some of the things you can implement without much opposition from drivers. You know bicycle infrastructure is so much cheaper and more beneficial than any type of infrastructure, so let’s get serious and start executing it. Share use paths exist, but not where there is any significant amount of pedestrians. Also they wouldn’t be as narrow as this. I didn’t say that anywhere in my post to copy everything from the Dutch but there are sure a lot to copy from. If you ever live in the States, you would toot the same horn. We have only 1% of modal share in the entire country and an accidental cycling rate at 2%. Drivers get a slap on the wrist when they kill, their license doesn’t even get suspended. All they say is that they didn’t see. In SF, 0.5% of the transportation budget is spent on bike infrastructure but we have 4% cycling rate. People are obese and sedentary. Kids are raised up playing video games indoor, instead of becoming independent. Suburbs have caused people to be isolated from societies although there is a trend people are moving back to the cities. Some suburbs are urbanizing and that’s good too. 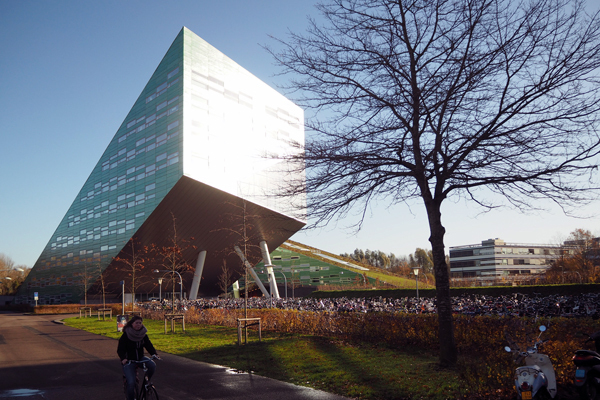 With these reasons, I sure want to copy the Dutch infrastructure except maybe things in Rotterdam. Regarding the shared path, I meant to say outside of city center. I will fix it. You can see clearly two people walking up ahead. The sidewalk to the right is not a sidewalk, it’s a driveway. We maybe talking about different parts of that street, but the road design about share path exists in the Netherlands, like you said. I can’t see from on this low resolution image whether those people are pedestrians or cyclists. If they are indeed pedestrians, they are most likely confused tourists. We are not talking about a different part of the street; the path pictured is definitely not a shared use path. To the right of your picture there is: parking, street, parking and then the sidewalk. It doesn’t make any sense to have a sidewalk that far, particularly in that layout. Also, that driveway/sidewalk ended. But I could be wrong and I should use a better photo which I have plenty of. Thanks. It may not make sense to you to have a sidewalk that far. But this is the rigorous segregation that is so important in making cycling pleasant and safe for everyone. FYI: Oakland has bike boulevards too. 🙂 I have ridden the North Oakland ones. I would love to see bike ramps, but I do have a bike handle to help me navigate my heavy bike around the BART station. It made a huge difference. I have the Walnut Studilo frame handle on my step-through bike. It makes it so much easier to deal with a few (or a lot) of steps and even little things like curbs, Highly recommended for any bike, they are available plain at the Oakland Supply Company. Or on Walnut’s site you can get it monogrammed.